The timing of this photo actually made me catch my breath. This is taken at the Plaza de la Revolucion in Cuba where citizens gather any time political leaders decide to come out of hiding to address the Cuban population. 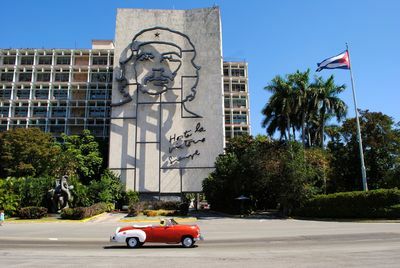 Che's face, his famous words, the classic car and Cuban flag blowing in the wind speaks volumes about Cuba and its history. George, Caroline, "Until Victory, Always" (2016). Study Abroad Photo Contest. 53.